Dori is a top-notch vocal instructor – I have already recommended her to countless colleagues and friends. She is a talented and highly engaging teacher, who facilitates a positive and fun learning experience every week, while still pushing you to constantly improve. I noticed a difference in my singing and confidence-level immediately, and plan to continue studying with her as long as I’m in the city. Dori was absolutely amazing. I have a pretty extensive singing background but hadn’t done much in the recent years and she made me feel so comfortable. She took me through a variation of different warm ups to focus on my strengths and weaknesses and then had me sing songs of my choice in which she gave very constructive feedback. I would 100% recommend her as a vocal coach! "I’ve been taking lessons with Dori for a little over a month and I am utterly blown away by the progress we have made. 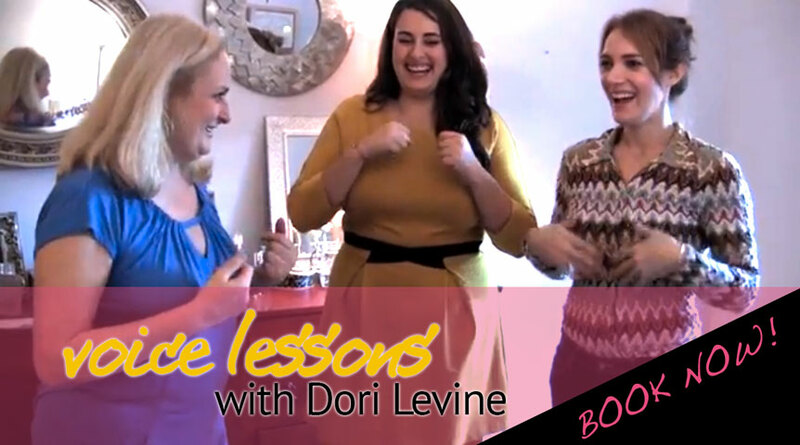 Dori is not just a gifted singer and teacher – she’s an intuitive. She knows exactly what her students are looking for and her methods encourage the student to find their own voice and style. Being that her lessons are in the privacy and comfort of her beautiful home, the environment is warm and nurturing. You may come as you are and leave with more confidence about yourself. She takes you on a personal journey and turns your body into an instrument. She does this all for a very reasonable price. Thank you, Dori!" "I recently began taking vocal lessons with Dori Levine and have found an amazing transformation in my vocal ability as well as confidence. Dori has taught me extremely helpful exercises to facilitate intonation, pitch, and breath control. She is wonderful to work with and I give her my highest recommendation!" "Dori has taken my voice to places I’d never thought possible. She truly understands the artist within. Dori has shown me the thrill of being a singer, and how it serves to heal the soul. I feel very lucky!" Please inquire about my convenient rates designed to fit your budget. Feel free to CALL or email for more information or to schedule a lesson. Throughout 20+ years of teaching I have developed my own approach to the art of teaching singing. I am continually surprised and pleased with the dramatic results that I witness, often during the first lesson. I specialize in a “voice as an instrument” approach. I have created my own “body, breath, voice warm-up” as I see these three elements as inseparable. The warm-up encourages relaxation, effortless vocalizing, a positive singing stance, whole body breathing and brings an awareness of "you" as your instrument. I work with developing strong musicianship skills and ear training which are also tremendous confidence builders, so necessary for singers. I have many tools to open your voice so that you can use your vocal instrument to it’s potential with all of it’s colors, nuances, range and power. My teaching method combines traditional exercises that focus on specific skills such as strength, flexibility, intonation, range and breath support with exercises to free the voice. We will explore vocal possibilities in search of your own personal sound and style. I encourage expressing your own originality. We'll find what is special about you and expand upon it. Teaching voice is a vast subject. For some students a few lessons are enough as the first handful of lessons are especially powerful. For other students who prefer to go more deeply the work can continue for years. It’s up to you as to how many lessons you take. Lessons and vocal exercises are personalized according to your needs. A variety of gentle body stretches, relaxation & awareness work breath work & exercises to warm & open the voice; tools that you can use for the rest of your life. Traditional exercises to work on developing & improving specific skills. Improvisational exercises to explore the voice searching for personal style, nuances & colors & one’s own language. I truly coach for greatness and I get results! If you have a recording or performance coming up it's a really good idea to invest in some coaching before you spend lots of money in the studio and/or invite everyone you know to come and hear you perform. I can help you up your vocals several notches!